이 경전은 당(唐)나라 때 삼장법사(三藏法師) 의정(義淨)이 편찬한 것을 11세기에 대장도감에서 판각한 초조대장경의 일종으로, 승속(僧俗)의 사람들이 물을 사용하는 방법에 대해 설한 경전이다. 이 경전에서는 물을 세 종류, 즉 비시수(非時水), 시수(時水), 촉용수(觸用水) 등으로 나누고 그에 합당한 사용법을 설명한다. 그런데 만약 그러한 용법을 어기면 그 내용에 따라서 불수용죄(不受用罪), 증촉죄(增觸罪), 숙촉죄(宿觸罪), 악촉죄(惡觸罪), 오수착음식기죄(汚手捉飮食器罪), 부정죄(不淨罪) 등 여섯 가지 죄에 해당하고, 더 나아가서는 15,480가지의 죄에 이른다고 말한다. 이러한 내용은 기본적으로 설일체유부(說一切有部)의 율장에 의거한 것으로 알려져 있다. 이 경전은 모두 5장 1축으로 되어 있는 짤막한 불경으로, 장의 크기는 46.3cm이다. 장정은 권축장(卷軸裝) 형태로 되어 있는데, 권말에 축봉(軸棒)이 있으나 권수의 표지(裱紙)는 결락되어 있는 상태이다. 표지가 떨어져 나간 상태이므로 권자(卷子)를 펼치면 제1장이 보인다. 권두에 보이는 경제(經題)에는 ‘수용삼수요행법(受用三水要行法)’이 보이고 그 아래로 ‘영(英)’이라는 함차(函次)가 기입되어 있다. 경제의 다음 행에 ‘번경 삼장법사 의정 찬(翻經三藏法師義淨撰)’이란 저자가 표시되어 있어, 당나라의 의정(義淨)이 찬자(撰者)임을 밝히고 있다. 판식의 특징을 살펴보면, 변란은 상하단변(上下單邊)으로 되어 있어 일반적으로 권축장 및 절첩장 형식에 보이는 특징이다. 판수제는 확실치 않으나, ‘수용삼수요법(受用三水要法)’이란 약칭과 그 아래로 장수 및 함차(函次)가 차례로 기입되어 있는 것으로 보인다. 경문 중에는 송나라 태조의 조부의 피휘자(避諱字)인 ‘경(敬)’자의 마지막 획이 결획되어 있다. 자체는 중국의 북송판 또는 재조본과 비교하여 보다 듬직하고 해정한 해서체로 판각술이 매우 돋보인다. 이 경전은 11세기에 판각한 초조대장경으로 보존상태가 양호하고 한국불교문화사 및 서지학 연구에 희귀하고 귀중한 자료이다. 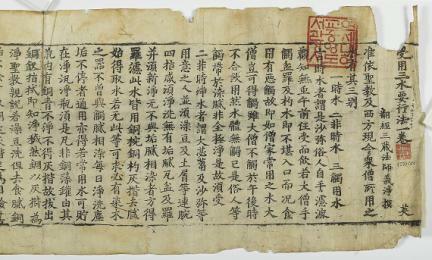 With the full title Suyong samsu yohaengbeop (Essential Actions for the Use of Water, or Shouyong sanshui yaoxingfa in Chinese), this sutra for teaching the right ways to use water was compiled by Tripitaka Master Yijing during the Tang Period and printed at the Directorate of Tripitaka Publications of the Goryeo Dynasty in the 11th century. The sutra explains for clerics and laymen the proper usage of three kinds of water, that is, non-seasonal water, seasonal water and touching water. It says those who violate the teachings would commit six kinds of sin, which can further be classified into 15,480 different kinds of sin. The teaching is known to have been based on the monastic regulations of the Sarvastivada School of early Hinayana Buddhism. This is a short sutra consisting of five pages printed on a scroll, each page 46.3cm wide. The scroll has a handle at the end but the front cover has been lost. The first page has the sutra name and underneath is the Chinese character ‘英’ used for pagination. The following line reads, Translated and compiled by Tripitaka Master Yijing. Each page has single boundary lines at the top and the bottom, a style often found in both rolling and folding scroll books. Missing from the text is the last stroke of the Chinese character ‘敬’, which formed the name of Song emperor Taizu's grandfather. The regular script type was carved with outstanding skill. The type looks solid and neat when compared with those of the Northern Song edition of the Tripitaka and the second edition of the Tripitaka Koreana. The sutra is in good condition. It is a rare and valuable material for study of Korean Buddhist history and bibliographical research.